pazzobooks (Roslindale): If you liked The Fountainhead but thought the philosophy took a back seat to character development and plot, Atlas Shrugged is great - not concerning itself with such outmoded details like characters who might exist and avoiding exposition, Atlas Shrugged is the most pedantic, two-dimensional book ever. Huzzah. Random House, New York, 1957 First Edition, First Printing with the words "FIRST PRINTING" printed on the copyright page. This copy is authentically SIGNED by Ayn Rand on the front free endpaper. A beautiful copy. This ORIGINAL dustjacket is vibrant in color with slight wear to the edges. This First Issue dustjacket has the $6.95 printed price present and the 10/57 code present on the front flap. The book is in great shape. The binding is tight with NO cocking or leaning and the boards are crisp. The pages are exceptionally clean with NO writing, marks or bookplates in the book. Overall, a magnificent copy of this TRUE FIRST EDITION in collectors condition. We buy SIGNED Rand First Editions.. Signed by Author(s). 1st Edition. Hardcover. Fine/Fine. New York: Random House, 1957. First edition of one of the most influential novels of the twentieth century. Large octavo, original green cloth, frontispiece stamped in gilt, spine stamped in black and gilt. Presentation copy, inscribed by the author on the front free endpaper two months prior to the publication date, "To Ray and Betty Nelson (and to Ev Suffens) - - affectionately - Ayn Rand 8/22/57." The recipient, Ray Nelson (who went by the on-air name 'Ev Suffens') was the host of the late night jazz radio program Midnight Jamboree on radio station WEVD. Rand's assistant and close personal friend, Barbara Branden wrote of Rand, "...jazz had a kind of symbolic significance to Rand...Rand once said that what she would love more than anything is to never have to think about politics, because it wouldn't be necessary. She loved what she saw as the frivolous in America, that this was a country where you didn't have to be concerned whether you were going to to starve to death before tomorrow, or freeze to death, or to be put in prison, or sent to Siberia. You could be concerned with things like lipstick and silk stockings. And jazz." An excellent example in a near fine dust jacket. Jacket design by George Salter. An exceptional association copy. From 1943 until its publication in 1957, [Rand] worked on the book that many say is her masterpiece, Atlas Shrugged. This novel describes how a genius named John Galt grows weary of supporting a society of ungrateful parasites and one day simply shrugs and walks away. He becomes an inspiration to like-minded men and women, all of whom eventually follow his example, until society, in its agony, calls them back to responsibility and respect. Again [as with Rand's novel The Fountainhead in 1943] reviews were unsympathetic, and again people bought the book" (ANB). The theme of Atlas Shrugged, as Rand described it, is "the role of man's mind in existence." The book explores a number of philosophical themes that Rand would subsequently develop into the philosophy of Objectivism. By 1984 more than five million copies of Atlas Shrugged had been sold, and in a 1991 Library of Congress survey Americans named it second only to the Bible as the book that had most influenced their lives. It is the basis for the trilogy of film adaptations subtitled Part I (2011), Part II (2012), and Part III (2014). UNMATCHED AYN RAND Collectible! 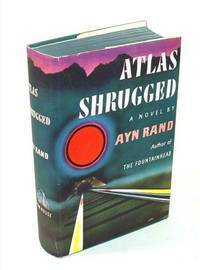 A beautiful First Edition copy of Atlas Shrugged in a dazzling jacket with only minor chipping at edges. Accompanying the book is a Typed Letter Signed by Ayn Rand, (November 23, 1957, the month following publication) to theatrical producer Ralph Roseman, thanking him for his appreciative letter to her about Atlas and for liking it "for the right reasons." In the second paragraph, Rand explains that she enclosed a "circular about a course of lectures by Nathaniel Branden," which she is sending "to all those who have expressed themselves as friends of Atlas Shrugged." A jaw-dropping Ayn Rand acquisition! Book#P1440. $17,500. We carry THE largest selection of rare, signed and manuscript Ayn rand on the planet! Random House, New York, 1957 First Edition, First Printing with the words "FIRST PRINTING" printed on the copyright page. This copy is authentically INSCRIBED and SIGNED by Ayn Rand on the front free endpaper. This ORIGINAL dustjacket is rich color with minor repair. This First Issue dustjacket has NO chips or tears and the $6.95 printed price is present with the 10/57 printed code present on the front flap. The book is in nice condition. The binding is tight with minor wear to the spine and edges. The pages are clean with NO marks or bookplates in the book. A wonderful copy of this TRUE FIRST EDITION SIGNED by Ayn Rand and housed in a custom clamshell slipcase for preservation.. Signed by Author(s). 1st Edition. Hardcover. Near Fine/Fine. Random House, New York, 1957 First Edition, First Printing SIGNED by Ayn Rand on a typed letter by the author laid into the book. This First Issue dustjacket has light wear to the spine and edges. The book is bound in the publisher's green cloth and is in great shape with minor wear to the boards. The pages are clean with NO marks or bookplates in the book. A lovely copy SIGNED by the author.. Signed by Author(s). 1st Edition. Hardcover. Fine/Near Fine. New York: Random House, 1957. First edition of one of the most influential novels of the twentieth century. Large octavo, original green cloth, frontispiece stamped in gilt, spine stamped in black and gilt. Boldly signed by Ayn Rand on the half-title page. Fine in a near fine dust jacket with a touch of shelfwear. Jacket design by George Salter. Housed in a custom half morocco clamshell box. An exceptional example, rare and desirable signed. From 1943 until its publication in 1957, [Rand] worked on the book that many say is her masterpiece, Atlas Shrugged. This novel describes how a genius named John Galt grows weary of supporting a society of ungrateful parasites and one day simply shrugs and walks away. He becomes an inspiration to like-minded men and women, all of whom eventually follow his example, until society, in its agony, calls them back to responsibility and respect. Again [as with Rand's novel The Fountainhead in 1943] reviews were unsympathetic, and again people bought the book" (ANB). The theme of Atlas Shrugged, as Rand described it, is "the role of man's mind in existence." The book explores a number of philosophical themes that Rand would subsequently develop into the philosophy of Objectivism. By 1984 more than five million copies of Atlas Shrugged had been sold, and in a 1991 Library of Congress survey Americans named it second only to the Bible as the book that had most influenced their lives. It is the basis for the trilogy of film adaptations subtitled Part I (2011), Part II (2012), and Part III (2014). FIRST EDITION. Inscribed and signed by Rand to Mr. and Mrs. Capuletti "for your triumph over the non-objective in art" and dated 17 May 1960. Jose Manuel Capuletti was perhaps Rand's favorite painter, and she collected his works avidly. She wrote in 1966, "to the extent that one may detect certain dominant values in different cultures, one could say the work of Capuletti has the passionate intensity of Spain, the elegance of France, and the joyous, benevolent freedom of America." "The book made Rand a hero to many business owners, executives, and self-identified capitalists, who were overjoyed to discover a novel that acknowledged, understood, and appreciated their work … She presented a spiritualized version of America's market system, creating a compelling vision of capitalism that drew on traditions of self-reliance and individualism but also presented a forward-looking, even futuristic ideal of what a capitalist society could be … Rand's defense of wealth and merit freed capitalists from both personal and social guilt simultaneously … In Rand business had found a champion, a voice that could articulated its claim to prominence in American life" (Burns, Goddess of the Market: Ayn Rand and the American Right). Alan Greenspan declared, "Of all my teachers, Arthur Burns and Ayn Rand had the greatest impact on my life… Ayn Rand expanded my intellectual horizons, challenging me to look beyond economics to understand the behavior of individuals and societies." NYPL Books of the Century 163. Original cloth, without dust jacket. Rubbed, tear to hinge. Very good. Random House, New York, 1957 First Edition, First Printing SIGNED by Ayn Rand on a tipped in signature. This is the TRUE FIRST EDITION with the words "FIRST PRINTING" printed on the copyright page. This ORIGINAL price clipped dustjacket is rich in color with minor near the top spine. This First Issue dustjacket has the the 10/57 code printed on the front flap. The book is in nice shape. The binding is tight with minor wear to the edges. The pages are clean with NO writing, marks or bookplates in the book. A sharp copy authentically SIGNED by Ayn Rand.. Signed by Author(s). 1st Edition. Hardcover. Fine/Near Fine. New York: Random House, 1957. First Edition. Very good in dust jacket; in a custom quarter-leather clamshell box. Presentation copy; inscribed by the author a few months after publication. We have been reliably informed by someone involved with the publication that this book, while enjoying a large initial printing, sold unexpectedly slowly at first, even though it quickly became a bestseller. To this day, hundreds of thousands of copies are sold every year. While the book took decades to reach the movie screen, it turned out to not be worth the wait. Random House, New York, 1957 First Edition, First Printing SIGNED by Ayn Rand on a laid in signature. This ORIGINAL dustjacket is rich in color with slight wear to the edges. This First Issue dustjacket has the 10/57 code present on the bottom flap. The book is in great condition. The binding is tight with minor wear to the edges. The pages are clean with NO writing, marks or bookplates in the book. Overall, a wonderful copy SIGNED by the author housed in a custom clamshell slipcase for preservation.. Signed by Author(s). 1st Edition. Hardcover. Fine/Fine. Random House, New York, 1957 Limited Edition of 2000 copies. This copy is authentically SIGNED by Ayn Rand. A fantastic copy bound in the publisher's original blue cloth. The binding is tight with NO cocking or leaning and the boards are crisp. The lettering on the spine is vibrant with NO rubbing or fading. Overall, a spectacular copy with the publisher's original slipcase that was issued with the book. Includes the acetate dustjacket. We buy SIGNED Ayn Rand First Editions.. Signed by Author(s). 1st Edition. Hardcover. Fine/Fine. Random House, New York, 1957 First Edition, First Printing with the words "FIRST PRINTING" printed on the copyright page. A magnificent copy. This ORIGINAL dustjacket is rich color with slight wear to the edges. This First Issue dustjacket has the $6.95 printed price present with the 10/57 printed code present on the front flap. The book is in fantastic shape. The binding is tight with slight wear to the edges. The pages are clean with NO writing, marks or bookplates in the book. A stunning copy of this TRUE FIRST EDITION housed in a custom clamshell slipcase for preservation.. 1st Edition. Hardcover. Fine/Fine. THE most beautiful copy of the 10th Anniversary Limited Edition, 188 of 2000, that we've ever seen in 45 years of collecting Ayn Rand since I met her in Boston. Book appears to be unread, slipcase is Library-Quality. You'll never find a better copy. Book #P4108. $6800. We carry the largest selection of rare, signed, and manuscript Ayn Rand on the planet! Random House, 1957 First Edition, First Printing. A magnificent First Issue dustjacket with the $6.95 price present on top flap and 10/57 code on bottom flap. This ORIGINAL sophisticated is rich in color with NO chips or tears. The book is in excellent condition. The binding is tight with light wear to the boards. The pages are clean with no writing, marks or bookplates in the book. Overall, a beautiful copy housed in a custom clamshell slipcase.. 1st Edition. Hardcover. Fine/Fine. Random House, New York, 1957 First Edition, First Printing with the words "FIRST PRINTING" printed on the copyright page. This ORIGINAL price clipped dustjacket is vibrant in color with minor wear to the panels. This First Issue dustjacket has the 10/57 code present on the bottom flap indicating a TRUE FIRST EDITION. The book is in excellent shape. The binding is tight and the boards are crisp with slight wear to the spine. The pages are clean with minor wear to the edges. There is NO writing, marks or bookplates in the book. A beautiful copy in collector's condition. Includes a custom clamshell slipcase for preservation and presentation.. 1st Edition. Hardcover. Fine/Fine. Random House, 1957 SIGNED/LIMITED EDIITON. A beautiful, almost flawless copy that appears UNREAD. This limited edition is SIGNED by Ayn Rand. Limited to 2000 copies printed of this special edition. Overall, a superb copy with a beautiful slipcase. Includes an acedate cover to protect the book. We buy SIGNED Ayn Rand First Editions.. Signed by Author(s). 1st Edition. Hardcover. Fine. Random House, 1957 First Edition, First printing. A beautiful sophisticated dustjacket that is vibrant in color with NO chips or tears. The book is in wonderful shape. The binding is tight, and the boards are crisp with light wear to the edges. The pages are clean with no writing, marks or bookplates in the book. Overall, a sharp copy of this TRUE FIRST EDITION in collector's condition. We buy Ayn Rand First Editions.. 1st Edition. Hardcover. Fine/As New. First edition/first printing (stated) with the correct first printing points (6.95 price, 10/57 code on front flap). A fine book in a near fine dust jacket. A stunning copy of one of the most influential books of all time and a book that reads as important today as it did when published. This volume is in fine condition with a tight binding, brilliant lettering on the cover and spine with no fading, beautiful white pages with no markings. Housed in a near fine dust jacket that shows very minor rubbing to the top spine end else fine; no tearing, no staining, no fading - a crisp, clean dust jacket. In archival protection and placed in a custom clamshell box. An extraordinary copy that has not been restored, is not price clipped, is not ex-lib and with no markings. A cornerstone collectible to anyone's 20th century literature collection! New York: Random House. NF/NF. 1957. 1st Edition. Hardcover; 1st Printing. 1st edition/1st printing, Random House, 1957. NF+/NF+. Stated First Printing with all the correct points met for book and dustjacket. A lovely copy of this bulky book and fragile dustjacket. The Near Fine+ book (really close to Fine) is clean, straight and tightly bound with no soiling and no previous owner marks or names, the binding gilt on the front panel and spine is bright, unscratched and unfaded, binding edges and corners are unworn, and the dark green upper page edges are unfaded and rich in color. The only faults I can see is the usual tiny bit of faint smuding to the extreme outer corners of the bottom page edges from the weight of the book causing them to touch shelving at some point in its life, and an extremely tiny (less than sharpened pencil point sized) ink mark also on the lower page edges. The Near Fine+ price intact dustjacket has the correct '10/57' on the bottom of the front flap, the publisher's name/address on the bottom of the back flap, and the striking colors and design of this famous Salter-designed dustjacket are bright and unfaded. There has been a very small amount of extremely well done professional paper conservationist work that's hard to even see in little areas of the edges near the spine folds and a couple of the flap fold ends, there's just a touch of surface rubbing to the back panel, a mere hint of edge wear to a small portion of the lower back panel edge, and a couple of tiny very slightly toned spots in the white area of the back panel. Beautiful book and dustjacket that presents very near perfectly. This one needs no content synopsis - the author's opus, probably the all-time best selling fiction book with, it seems, never-ending relevance for good or bad as to what's happening in our world well over half a century after the book was published. ; 8-11/16" x 6"; 1168 pages . New York: Random House, 1957. Early printing of one of the most influential novels of the twentieth century. Large octavo, original green cloth, frontispiece stamped in gilt, spine stamped in black and gilt. Inscribed on the front free endpaper, "To Christopher Cooley- Cordially Ayn Rand 4/23/64." Fine a near fine first issue dust jacket with a touch of rubbing and a few closed tears. Jacket design by George Salter. A nice example. From 1943 until its publication in 1957, [Rand] worked on the book that many say is her masterpiece, Atlas Shrugged. This novel describes how a genius named John Galt grows weary of supporting a society of ungrateful parasites and one day simply shrugs and walks away. He becomes an inspiration to like-minded men and women, all of whom eventually follow his example, until society, in its agony, calls them back to responsibility and respect. Again [as with Rand's novel The Fountainhead in 1943] reviews were unsympathetic, and again people bought the book" (ANB). The theme of Atlas Shrugged, as Rand described it, is "the role of man's mind in existence." The book explores a number of philosophical themes that Rand would subsequently develop into the philosophy of Objectivism. By 1984 more than five million copies of Atlas Shrugged had been sold, and in a 1991 Library of Congress survey Americans named it second only to the Bible as the book that had most influenced their lives. Basis for the trilogy of film adaptations subtitled Part I (2011), Part II (2012), and Part III (2014). Random House, 1957, 1957 First Edition, first printing. An absolutely lovely copy of this true first edition seldom seen in this nice of condition. This original dustjacket looks new, and the colors are vibrant. This attractive first state dustjacket with the 10/57 code on the front flap of dustjacket has minor expert repairs that are hardly noticeable because they were done by a professional paper conservationist. The book is untouched, and is outstanding condition. The book is tight, fresh, and the pages are clean. There is no writing, marks or bookplates in the book. If you are looking for that stunning copy, here it is.. 1st Edition. Hardcover. As New/As New. Random House, New York, 1957 SIGNED/LIMITED EDITION. This special tenth anniversary edition is limited to two thousand copies, SIGNED by the author. This is number 1766. The book is bound in the ORIGINAL blue cloth with some light wear to the endpapers and page edges. The binding is tight with NO cocking or leaning. The pages are clean with NO writing or bookplates. Overall, an attractive copy authentically SIGNED by Ayn Rand with the ORIGINAL slipcase from the publisher. We buy SIGNED Ayn Rand First Editions.. Signed by Author(s). Hardcover. Fine. Early edition, published the same year as the First Edition INSCRIBED and SIGNED by Ayn Rand. This ORIGINAL early issue dustjacket is rich in color with NO chips or tears. The book is in great shape with some discoloration to the boards. The pages are clean with NO marks or bookplates in the book. A lovely copy INSCRIBED and SIGNED by the author. New York: Random House, 1967. Signed limited tenth anniversary edition. Fine/Near Fine. Signed, limited tenth anniversary edition. One of 2,000 copies signed by Ayn Rand as per limitation page, this copy is unnumbered. Bound in publisher's coarse blue cloth. Fine, nearly flawless in unprinted acetate wrapper, lightly rubbed and faintly edge worn. In Near Fine publisher's slipcase, lightly marked and sunned. A beautiful copy, signed by Ayn Rand. NY: Random House, 1957, 1957. FIRST EDITION NINTH PRINTING PRESENTATION COPY. 1 vol., inscribed and dated on the front blank endleaf by Rand "To Arthur Hecht - - Cordially - Ayn Rand 10/25/67" Bound in the publisher's original green cloth, inner and outer hinges fine, head and foot of spine fine, old tape residue to pastedowns, else fine, with the original DJ, not price clipped, VG+/FAIR. First Edition, First Printing. An attractive First Issue dustjacket that has the publisher's $6.95 printed price present and the 10/57 code printed on the front flap. This ORIGINAL dustjacket is rich in color with minor wear to the edges. The book is in fantastic shape and appears UNREAD. The binding is tight and the boards are crisp. The pages are clean with NO writing, marks or bookplates in the book. A wonderful copy of this TRUE FIRST EDITION. Ayn Rand: Atlas Shrugged. The Original dustjacket is the bright color with very slight wear to the edges. This First Issue dustjacket has the $6.95 printed price, the 10/57 first printing code present on the bottom front flap. The book is in excellent shape. The binding is tight with no wear to the edges. The pages are clean with no writing, marks or bookplates in the book. Condition: NF. Dust Jacket Condition: NF. New York: New York: Random House, 1957. First edition, first printing. First issue, correctly priced dustwrapper with 10/57 on the lower front flap & the publisher's name in full on the bottom rear flap. Hard to find copy of this all time classic. Book very good to near fine, with only slight bumping. Dj in protective cover. Bright with chip to lower front corner and wear and crease to edges. Great collectors copy. Pictures available. . Very Good. Hardcover. First Edition. 1957. Near fine first edition, first printing as stated on copyright page. Light rubbing on top and bottom spine ends. In very good first issue dust jacket, which fulfills all criteria for first issue, lacks review blurbs, and shows 10/57 on the bottom of the front flap. Light chipping at top and bottom of dust jacket and corners, closed rips on inside spine of dust jacket. Housed in custom-made slipcase. New York: Random House, 1957. First Edition. Cloth. Near fine/very good. Octavo, 1168pp. Original green cloth, gilt title over blue on spine, gilt initials on front cover. Top edge stained blue. Dust jacket in near fine condition, slight wear to bottom edge of spine, closed tear on bottom corner of cover, evidence of wear on spine beneath publisher, otherwise bright and clean. Original purchase price of $6.95 and 10/57 notation present on front flap. In protective mylar jacket. Test. A bright copy, attractive dust jacket. An excellent copy of this important work. Random House, 1957 First Edition, First Printing with the words "First Printing" printed on the copyright page. This First Issue dustjacket is rich in color with light wear to the spine and edges. This ORIGINAL dustjacket has the $6.95 printed price present with the 10/57 code on bottom flap of the dustjacket that are important points in identifying this First Issue dustjacket. The book is in wonderful shape. The binding is tight with minor wear to the edges. Overall, a sharp copy of this TRUE FIRST EDITION with an acetate cover to protect the dustjacket. We buy Ayn Rand First Editions.. 1st Edition. Hardcover. Near Fine/Near Fine. Random House, 1957 First Printing, 1957, as stated on the copyright page. Book is fine in original green cloth covered boards. Dust jacket is very good with original price of $6.95 printed on front flap. Slight rubbing on front and back panel at hinges to spine and small amount of chipping to spine ends and corners; else in very nice condition. Comes housed in a custom-made slipcase.. 1st Edition. Hardcover. Fine/Very Good. New York: Random House, 1967. Tenth Anniversary edition; Number 1911 of 2000 numbered and signed copies of one of the most influential novels of the twentieth century. Octavo, original blue cloth. Near fine in the original slipcase, with the original acetate. The theme of Atlas Shrugged, as Rand described it, is "the role of man's mind in existence." The book explores a number of philosophical themes that Rand would subsequently develop into the philosophy of Objectivism. By 1984 more than five million copies of Atlas Shrugged had been sold, and in a 1991 Library of Congress survey Americans named it second only to the Bible as the book that had most influenced their lives. It is the basis for the trilogy of film adaptations subtitled Part I (2011), Part II (2012), and Part III (2014). New York: Random House, 1957. First edition. Fine/Near Fine. A Fine copy of the book in Near Fine dust jacket. Previous owner's signature in ink on the rear pastedown. Dust jacket spine slightly nicked and crinkled, with a small chip at the crown. The jacket retains the critical $6.95 and 10/57 date code, essential for the first issue jacket. Rand's magnum opus, where she develops her objectivist theory and explores the question, "what if society's genius goes on strike?" Rand considered the book "not about the murder of man's body, but about the murder and rebirth of man's spirit." Atlas Shrugged has remained one of the most popular and influential books written in the twentieth century; one survey in 1991 found it second only to the Bible in having the greatest impact upon its readers. The book also placed first on Modern Library Reader's Poll of the Top 100 novels of the 20th century. "The reader will stay with this strange world, borne along by its story and eloquent flow of ideas" (Contemporary Newsweek Review). Fine in Near Fine dust jacket. New York: Random House, 1967. Tenth Anniversary edition; one of 2000 numbered and signed copies of one of the most influential novels of the twentieth century. Octavo, original blue cloth. Fine in the original slipcase, with the original acetate. A very sharp example. The theme of Atlas Shrugged, as Rand described it, is "the role of man's mind in existence." The book explores a number of philosophical themes that Rand would subsequently develop into the philosophy of Objectivism. By 1984 more than five million copies of Atlas Shrugged had been sold, and in a 1991 Library of Congress survey Americans named it second only to the Bible as the book that had most influenced their lives. New York: Random House, 1967. Tenth Anniversary edition; one of 2000 numbered and signed copies of one of the most influential novels of the twentieth century. Octavo, original blue cloth. Fine in the original slipcase, with the original acetate. The theme of Atlas Shrugged, as Rand described it, is "the role of man's mind in existence." The book explores a number of philosophical themes that Rand would subsequently develop into the philosophy of Objectivism. By 1984 more than five million copies of Atlas Shrugged had been sold, and in a 1991 Library of Congress survey Americans named it second only to the Bible as the book that had most influenced their lives. It is the basis for the trilogy of film adaptations subtitled Part I (2011), Part II (2012), and Part III (2014). Random House, New York, 1957 First Edition, First Printing. This is the TRUE FIRST EDITION with the words "First Printing" printed on the copyright page. An attractive price clipped First Issue dustjacket that has the 10/57 code printed on the front flap. This original dustjacket is rich in color with minor wear to the edges. The book is bound in the ORIGINAL publisher's green cloth. The binding is tight with light wear to the boards. The pages are clean with NO writing, marks or bookplates in the book. A lovely copy in collector's condition.. 1st Edition. Hardcover. Near Fine/Near Fine. New York:: Random House,, .. Special Tenth Anniversary Edition [Ninth Printing]; No. 632 of 2,000 copies signed by Ayn Rand.. publishers cloth in clear mylar wrapper and slipcase.. A fine copy.. 8vo,. New York:: Random House, 1957. A gorgeous copy of Rand's famous novel. A few tiny nickes to bottom of spine otherwise in pristine condition. Ayn Rand's magnum opus is a philosophical thriller, the story of a society's slow collapse as the men of ability go on strike against the creed that treats them as sacrificial animals.. First Edition. Near Fine/Near Fine. 8vo..
New York: Random House 1957, 1st edition. (hardcover) , 1168pp, [2pp About the Author]. Fine in very good dust jacket. First edition, first state with first issue dust jacket. Thick 8vo. (8.75" X 6.0" inches). In original publisher's turquoise cloth, title compartment in black to spine with a double-ruled border in gold, lettering in gold, author's monogram in gold to top board. Top-edge coloured blue; fore-edge and bottom edge roughcut. Dust jacket priced $6.95 & dated 10 / 57 on the front flap. Dust jacket is mylar protected. A rare book in the original publisher's green cloth binding, pages are unusually clean and bright. Minor edgewear to DJ, with only small close tears without paper loss. Housed in custom green cloth slipcase, front sculpted after the famous jacket's 'Graphic Design' Lewis, Utopian Literature, p. 156. Sargent, British and American Utopia Literature, 1516- 1985, p. 268. Not in Negley. Formerly listed at $5000CDN. Reduced 40%. Now $3000CDN. Lesser 1st / 1st also available, discounted to $1000CDN..
New York: Random House, 1957. 1168 pages. Title page has small chip out of bottom corner, otherwise pages clean, good condition. Beige endpapers.Crease at bottom corner back free endpaper. Previous owner's name, gift inscription and small number top of ffep. Name top of front paste down endpaper. Blue top edges. Green cloth with gilt initials on upper cover. Black cloth label, gilt border + title on spine. Boards + spine lightly soiled, half circle water mark on upper cover. Green and white dust jacket illustrated in color on upper cover and b/w on lower cover. Colors vivid. Edges, head/tail of spine and corners lightly worn. Small chips on lower spine edges and at head of spine. My price US$2000.00. VG/VG. 1st Edition. Hard Cover. Very Good/Very Good. Random House, 1957 First Edition, First Printing. An attractive dustjacket that is vibrant in color, with light wear along the folds and edges. Otherwise, this unsophisticated dustjacket is quite beautiful, with no chips to the spine or discolorization. The book is in nice shape. The boards are crisp with slight rubbing to the panels. The pages are clean, with light wear to the edges. Overall, a sharp, clean copy of this true first edition housed in a custom clamshell slipcase for presentation.. 1st Edition. Hardcover. Fine/Fine. New York:: Random House,, .. First edition, first printing.. publishers cloth in dust jacket. . A very near fine copy in a very good jacket with some light use to the extremities of the spine. The spine of the jacket is very slightly darkened. An attractive copy. . 8vo,. New York: Random House, 1957. First edition of one of the most influential novels of the twentieth century. Thick octavo, original green cloth, frontispiece stamped in gilt, spine stamped in black and gilt. Signed by one of the dedicatees Nathaniel Branden on the dedication page. Branden was an associate and romantic partner of Ayn Rand, and played a prominent role in the 1960s in promoting Rand's philosophy, Objectivism. In 1950, after he had read The Fountainhead and exchanged letters and phone calls with Ayn Rand, Branden and his then-girlfriend Barbara Weidman visited Rand and her husband Frank O'Connor at their Los Angeles home. The four became close friends, with Branden and Rand in particular sharing a vivid interest in philosophical exploration and development. After the publication of Rand's novel Atlas Shrugged, and sensing an interest on the part of Rand's readers in further philosophic education, Branden created in 1958 the Nathaniel Branden Institute, originally Nathaniel Branden Lectures, to disseminate Rand's philosophy of Objectivism, by offering live and taped lecture courses by Rand, Branden, and a variety of other Objectivist intellectuals (including Alan Greenspan, whom Branden had brought into Rand's fold). During this time Branden also contributed articles to Rand's newsletters on subjects ranging from economics to politics to psychology. Branden's work at NBI included translating the principles expressed by Rand in her fiction and non-fiction writing into a systematized construct that became known as Objectivism. Near fine in a very good first issue dust jacket. Jacket design by George Salter. From 1943 until its publication in 1957, [Rand] worked on the book that many say is her masterpiece, Atlas Shrugged. This novel describes how a genius named John Galt grows weary of supporting a society of ungrateful parasites and one day simply shrugs and walks away. He becomes an inspiration to like-minded men and women, all of whom eventually follow his example, until society, in its agony, calls them back to responsibility and respect. Again [as with Rand's novel The Fountainhead in 1943] reviews were unsympathetic, and again people bought the book" (ANB). The theme of Atlas Shrugged, as Rand described it, is "the role of man's mind in existence." The book explores a number of philosophical themes that Rand would subsequently develop into the philosophy of Objectivism. By 1984 more than five million copies of Atlas Shrugged had been sold, and in a 1991 Library of Congress survey Americans named it second only to the Bible as the book that had most influenced their lives. Atlas Shrugged is a trilogy of American science fiction drama films. Basis for the trilogy of film adaptations subtitled Part I (2011), Part II (2012), and Part III (2014). New York: Random House, 1957 First edition - "First Printing" so stated on copyright page. First issue dust jacket with $6.95 price and "10/57" at bottom of front dustwrapper flap and publisher's name and address bottom of back flap. 8vo. Green cloth stamped in black and gilt. Top page edges stained blue gray. Tiny hole in cloth in gutter of front board. Tape removal mark near center of rear free endpaper. Jacket was formerly in an acetate jacket cover with black tape at top and bottom edges then jacket cover was clear taped to cover so book has a few small tape stains at edges because of this otherwise bright and clean. Binding is tight. Nice dust jacket not faded. Jacket has a little wear at top of spine corners. Jacket has remained free of the black tape residue except for two tiny spots. Jacket in new acetate cover. Very good or better/near Very Good..
Random House, New York, 1957 First Edition, First Printing with the words "First Printing" printed on the copyright page. This ORIGINAL First Issue dustjacket has has the $6.95 printed price present and the 10/57 code present on the front flap. The ORIGINAL dustjacket has light wear to the spine and edges. The book is bound in the ORIGINAL green cloth from the publisher. The binding is tight with light discoloration to the boards. The pages are clean with NO writing, marks or bookplates in the book. A collectable copy of this TRUE FIRST EDITION.. 1st Edition. Hardcover. Fine/Near Fine. New York: Random House, 1957. Signed and inscribed by Ayn Rand at front endpaper: "To Gregory Huston - Cordially - Ayn Rand, 10/12/76". Signature obtained by long-time aficionado who met Ayn Rand on several occasions. Stated eighteenth printing; 1957 at copyright, no other dates. Capitalism: The Unknown Ideal first published in 1966 listed as latest title by Ayn Rand. Green boards, black cloth spine wrap, blind-stamped cover initials and gilt spine titles, some spine rub, shelf wear, discoloration. Deckled pages generally very good, no writing; moderate discoloration at top edge to first few pages. Bind good, square; hinges intact. Original dust wrapper matching first edition in design, moderate shelf wear; clipped, protected in fine archival sleeve. Solid signed example, rare in any form, of Rand's magnum opus in near very good dust jacket. In Rand's greatest achievement - and last work of fiction - she dramatizes her unique philosophy through an intellectual story that integrates ethics, metaphysics, epistemology, politics, and sexuality. Set in a near-future U.S.A. whose economy is collapsing as a result of the mysterious disappearance of leading innovators and industrialists, this novel presents an astounding panorama of human life. Endowed w/larger-than-life characters and charged with towering questions of good and evil, Atlas Shrugged is a revolutionary epic. Rare investment. 1184 pages. Insured post.. Signed by Author. First Edition. Hardcover. Good/Good. 8vo - over 7¾" - 9¾" tall. Book. New York: Random House, 1957. First Edition. Cloth. Very good/very good. Octavo, 1168pp. Original green cloth, gilt title over blue on spine, gilt initials on front cover. Stated first printing on copyright page. Top edge dyed blue. Dust jacket in very good condition, light toning to spine, wear to edges, closed tear along top of spine, 2cm loss along bottom of rear panel. Original purchase price of $6.95 and 10/57 notation present on front flap. In protective mylar jacket. An attractive copy of this important historical work.